MRI technologists use their knowledge of both MRI machines and anatomy – physics and biology – to produce clear, high-contrast images that doctors can use to identify various problems in the human body. With demand for MRI techs projected to grow over the next several years, those interested in the profession can read more about what‘s involved with the job, and how to prepare for a career as an MRI technologist. Magnetic resonance imaging (MRI) technicians play a vital role in the diagnosis process, which is why so many schools now offer programs of varying levels that lead to a career in this field. In addition to learning how to properly produce and analyze an MRI, students will also develop their understanding of patient care, human anatomy, and the ethics of working in the medical field. We know how many schools offer these programs, so we’ve looked into what each school has to offer in terms of student success rates, available services, and class sizes. 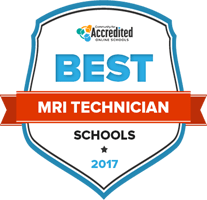 Look below to explore the best MRI tech programs for 2017. Students can choose from either on-campus or online programs to get the education required to be an MRI technologist. To help sort through the options, use the search tool below to research a specific school or to narrow the list by criteria such as location or degree level. Several paths are open to students who wish to become MRI technologists, from completing a certificate or diploma program to pursuing a degree at the associate or baccalaureate level. While most programs are delivered through traditional schools or colleges, there are also some available through hospitals. Some programs focus specifically on MRI training and are designed to get students ready for certification as quickly as possible. These programs typically run between one year to 18 months, and include both classroom work and intensive hands-on experience. Several of these programs are accredited by the American Registry of Magnetic Imaging Resonance Technologists (ARMRIT), and upon completion graduates can apply for ARMRIT certification. A more common route is for students to get an associate or bachelor’s degree either specifically in MRI technology or in another health-related field. As of 2015, the American Registry of Radiologic Technologists (ARRT), a professional organization that accredits schools and issues certifications, requires individuals to hold a degree before certification. While there is some flexibility of which degree is chosen, a typical option is radiologic technology. After earning their degrees, graduates then undertake a specialized MRI training program to prepare them to qualify for certification. Individuals who already hold an associate degree in another field may also take a graduate certificate course to specifically prepare them for work as an MRI technologist. Time to Complete One year to 18 months. Credential Earned Certificate or Diploma. Students should learn the fundamentals of MRI technology and how to apply it in clinical capacities. To be admitted into a program, students must hold a high school diploma or GED; upon graduation they are eligible to sit for certain licensing or certification exams. Through a combination of classroom work and hands-on practice, students can learn the details of operating MRI scanners and the various steps involved with carrying out a procedure, from preparatory work to follow-ups. They also study anatomy, pathology, legal and ethical issues, and principles of patient care. Education outcomes are similar to those in a certificate or degree program; graduates should be proficient in operating MRI equipment and working with patients. Students must hold a high school diploma or GED prior to enrollment; upon graduation they should be prepared to seek certification from the ARRT or ARMRIT. The additional liberal arts education acquired with an associate degree positions graduates to move into more advanced roles. Coursework involves all aspects of safely and adequately preparing for and performing diagnostic imaging, including but not limited to magnetic resonance imaging. Students learn how to work with physicians to produce the particular images needed to assist in diagnosis; as well as gain experience interacting with patients, keeping records, and maintaining equipment. Topics include professionalism, how to effectively communicate with patients, how to accommodate patients of different ages, assessing a patient’s wellbeing, and controlling infections. Students review the structures and functions of the body, including the respiratory, circulatory, nervous, and musculoskeletal systems. Knowledge is applied to patient positioning and obtaining clear images during the MRI process. Students examine the causes, symptoms and expressions of various diseases, especially how examination of body tissues is used to diagnose conditions. Explores the history and organization of healthcare in America, and how clinical and financial factors influence patient care. Students learn the legal and ethical obligations and restrictions of medical professionals and how they impact patient care. A guide to safely producing and analyzing images. Students may also examine how imaging plays into the larger role of a physician’s diagnosis and treatment of a patient. Instruction is given on how to read a processed image. Proper terminology is taught in correlation with anatomy and physiology, and examination protocols are addressed. A multi-semester course conducted in a healthcare facility, the clinical practicum offers hands-on, supervised experience, and is an essential component in virtually all MRI training programs. While certification as an MRI technologist is not always necessary, most states require either certification or licensure. In addition, individual employers typically seek MRI technologists who demonstrate this level of proficiency and knowledge. Individuals may seek certification from either the American Registry of Radiologic Technologists or the American Registry for Magnetic Resonance Imaging Technologists. ARRT is more widely recognized in the industry, but ARMRIT certification may be beneficial to those who receive direct education in MRI technology without first pursuing an undergraduate degree. Commonly known as ultrasounds, sonography is another form of diagnostic imaging that uses sound waves. CT scans are advanced types of X-rays used to create cross-sectional images of body tissues. In this form of medical imaging, radioactive chemicals are used to produce cause reactions in the body that translate into visual representations. MRI technologists must apply their scientific and technical skills within the context of patient care. Patience and stamina are key to the job: procedures can be lengthy—more than an hour—and MRI technologists are by their patients’ sides the whole time. They must work with patients to keep them reassured, as well as to obtain the best images possible. Technologists also confer with physicians before and after the procedure to determine what images to get and how to interpret them effectively. Procedures take place in hospitals and other advanced medical facilities, and while most MRIs are scheduled during regular working hours, weekend or emergency work may be required at times. Unlike X-ray machines, MRI scanners do not use radiation technology, which is damaging to the human body. Instead, they depend on a magnet-based technology which is not only safer, but superior in creating two- and three-dimensional images of internal organs and other soft tissues. MRI technologists have a comprehensive understanding of how this technology works, and how to apply it in different situations. The process of obtaining an MRI begins before a patient arrives in the lab. First, MRI technologists must know what they’re looking for; to do so, they consult with radiologists or other doctors to determine what images to obtain. Next, they work directly with patients to explain the process and answer questions, obtain any necessary medical history, position them correctly in the machine, and guide them through the procedure. Although the magnetic fields used in MRIs are not harmful to humans, they are nonetheless extremely powerful, and MRI technologists are responsible for ensuring the safety and integrity of the area, so that other magnetic objects do not interfere with the procedure. Finally, an MRI technologist may assist in reading the resulting images and performing follow-ups for clarification or additional detail. Compared to careers in other medical fields, the time it takes to become a certified MRI technologist is relatively fast. Despite that, there are no shortcuts along the way: MRI technology is a specialized field, field, and students must take the requisite steps to become properly trained and certified. Students can choose to earn a certificate or diploma in MRI technology, or to first acquire an academic degree and complete specialized training after that. In either case, students should ensure that the program is approved by an accrediting organization. Get certified/licensed. Many states require MRI technologists to be licensed and/or certified. Certifications are offered through both AART and ARMRIT. Some employers prefer one or the other. Most training programs include plenty of hands-on experience; students then hone their skills in entry-level positions. In some cases, students may begin in other radiologic technologist positions, and later specialize in MRI technology. Finishing an MRI technologist training program and finding a job is only the first step. To keep up with new developments, move into supervisory positions, and retain certification, continuing education is a must. ARMRIT was created specifically for MRI technologists who do not have a prior background in radiology. The organization offers certifications and sponsors an annual seminar and provides information on schools and jobs on its website. ARRT is the primary accrediting and certifying organization in the field, and provides publications, resources and news for industry professionals. Offers important information on educational requirements, job responsibilities, salaries and employment statistics for MRI technologists. JRCERT helps students interested in MRI technology locate schools that meet its standards. Students specifically interested in online education can find links to schools, jobs and additional resources on this site. A division of the larger International Society for Magnetic Resonance in Medicine, SMRT is a worldwide organization devoted to providing education and professional support for MRI technologists.